Dharamshala: - On this very auspicious occasion of the seventy-sixth birthday of His Holiness the Dalai Lama, the Kashag, on behalf of all Tibetans in and outside Tibet, would like to offer our heartfelt greetings and at the same time single-mindedly beseech Your Holiness to remain with us to dispel the suffering of all human beings and especially to guide the Tibetans as long as possible. Today is a special day not only for the Tibetans but for people all over the world for whom a new champion of world peace was discovered. Taking this opportunity, the Kashag would like to offer our warm greetings to people all over world in general and particularly those who offer their support and stand in solidarity with Tibet and Tibetans. Throughout his entire life, His Holiness has been tirelessly working for the welfare of the Tibetan people and when Communist China violently annexed and occupied Tibet, His Holiness the Dalai Lama was forced to come into exile to protect Tibet and her rich cultural heritage, including the Buddha dharma. In exile, His Holiness the Dalai Lama led more than 100,000 Tibetans and rehabilitating them in settlements and building various institutions to preserve Tibetan culture and religion. His Holiness has also established many schools where the younger generation of exile Tibetans can get opportunities to study both modern and traditional education. For over half a century, His Holiness the Dalai Lama widely traveled all over the world to speak and promote the principles of peace and compassion. As a result the Buddha dharma has spread to many parts of the globe and won the support of many people and nations, which helped sustain the issue of Tibet alive on the global forum. The just cause of Tibet has become an issue of interest and many stand in solidarity with Tibet. Moreover, His Holiness the Dalai Lama has abandoned the idea of victory for oneself and defeat for the other and initiated the principle of the Middle Way Approach to resolve the issue of Tibet, which has won overwhelming majority support from the Tibetans inside and in Diaspora. This has also led to an increasing number of truth- and peace-loving people and nations around the world to clearly see that the issue of Tibet is a just cause and that the Chinese Communist authorities' position is wrong. In exile, His Holiness the Dalai Lama has also introduced democratic process with the establishment of democratic institutions such as the Tibetan Parliament-in-Exile, ratification of the Charter for Tibetans-in-Exile and the election of Kalon Tripa directly through popular people's vote. As the Tibetan people have more understanding of the democratic process and inculcate a higher level of democratic culture, His Holiness the Dalai Lama has recently devolved all his powers to an elected Tibetan leadership, which was the first time that such a historic step has been taken in Tibetan history. These are some of His Holiness the Dalai Lama's innumerable and immense achievements. On this extraordinary day, the Kashag would wish to gratefully thank and remember the visionary steps that His Holiness the Dalai Lama took in the democratization of the Tibetan polity and devolving all his powers to the elected Tibetan leadership, which will represent the six million Tibetans living in and outside Tibet and has empowered the elected leaders to continue to work hard. His Holiness the Dalai Lama's democratization of the Tibetan polity has given the Tibetans the opportunity to make the issue of Tibet more global and strengthened the legitimacy of the exile administration. However, a few people in our community, who are not satisfied with His Holiness the Dalai Lama devolving all his powers, still continue to criticize him without recognizing and respecting his tireless work for Tibet and the Tibetans. Taking democratic rights as an excuse, these people, who do not have to shoulder any responsibility and who are devoid of any principle and moral values, use their glib tongues to express their dissatisfaction. It is clear that these are aimed neither to improve the democratic culture nor for the welfare of society or for the improvement of Tibetan political discourse. And the fact that the society at large ignores these unjustified criticisms without challenging nor to responding to them is a sign that, perhaps, our collective merit is exhausted. On this special occasion, the 13th Kashag nearing its completion of term of office would like to pay our respect to the Tibetan people and at the same time would like to remind you the following. At this time when important changes are taking place in Tibetan political system, the exile community by abandoning regionalism and sectarianism, and by following democratic principles took active part and succeeded in electing a well-qualified new Kalon Tripa with immense majority support. This is a matter of pride and happiness as it signifies the unity among the Tibetans and it shows their political maturity. The Kashag would like to urge the Tibetans to uphold their spirit and determination by not being deterred by these political changes and His Holiness the Dalai Lama's devolution of all his powers, and should further work hard to carry forward the empowerment of Tibetan polity. Regarding the Sino-Tibetan dialogue, we have made our stand clear through the Memorandum on Genuine Autonomy for the Tibetan People and Note on the Memorandum on Genuine Autonomy for the Tibetan People. Thus from our side there is nothing new to add. However, it seems that the present leadership of the People's Republic of China has no desire to give any meaningful consideration of our Memorandum and its Note. But from our side, we have a firm determination to continue the dialogue process. Moreover, we have already formulated a clear stand and a firm base to carry forward the dialogue in accordance with any future change that may take place in the People's Republic of China. In our continued effort towards the welfare of exile Tibetans and specifically the education and the future direction of the younger generation, many programmes regarding further improvements of the settlements are being carried out and the Basic Education Policy was introduced. Though these may have produced some positive results, there are many other programmes where we have not satisfactorily succeeded as we had wished. However, we have no regret on our part for we tried and worked our level best. The Central Tibetan Administration managed to overcome our critical financial problems and presently the administration is self-reliant in terms of its basic needs. Due to recent political situation in Nepal, the Central Tibetan Administration has not been able to provide necessary support or to look after the welfare of the Tibetans living there. We are also deeply concerned and yet helpless that the Representative could not be appointed nor the Tibetan Welfare Association was able to register. Even our desperate efforts to relocate Tibetan in Nepal to other places in order to downsize the population was miserably failed. Of late we have appointed a Nepalese citizen as a voluntarily liaison for the Tibetans, and we hope that he can solve some of the immediate problems that Tibetans living there face. We request the Tibetans there to cooperate with him as and when needed in accordance with local situation. Since 2008, many brave and determined Tibetans in Tibet have carried out a series of non-violent campaigns. Particularly in the last few months, many people in Kirti Monastery and in several places including Kardze have selflessly taken part in peaceful protests. We stand in solidarity with them and pay our heartfelt tribute to them. And we pray for the immediate release of all those who are imprisoned and those who are being persecuted. As the immediate and the ultimate wellbeing of all Tibetan people depends upon His Holiness the Dalai Lama, his long life is the sole basis of the Tibetan people's welfare. It is a matter of immense happiness for us that His Holiness the Dalai Lama has time and again accepted to have a long life. 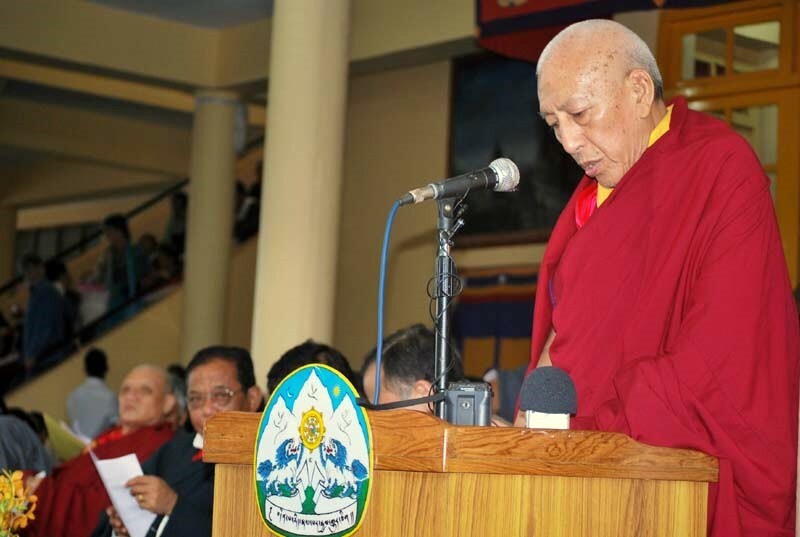 Furthermore, recently when the civil servants of the Central Tibetan Administration presented a long-life offering, the state oracle envisaged that His Holiness the Dalai Lama was promised to live till the age of 113. However, the state oracle stated that it depends upon the deeds and conduct of the Tibetan people. Thus, the Kashag would like to urge all Tibetans to engage in actions that will not breach the wishes of His Holiness the Dalai Lama and at the same time to work hard in preserving our traditional values. Finally, the Kashag prays for the long life of His Holiness the Dalai Lama and the immediate fulfilment of all his wishes. May the just cause of Tibet prevail soon!